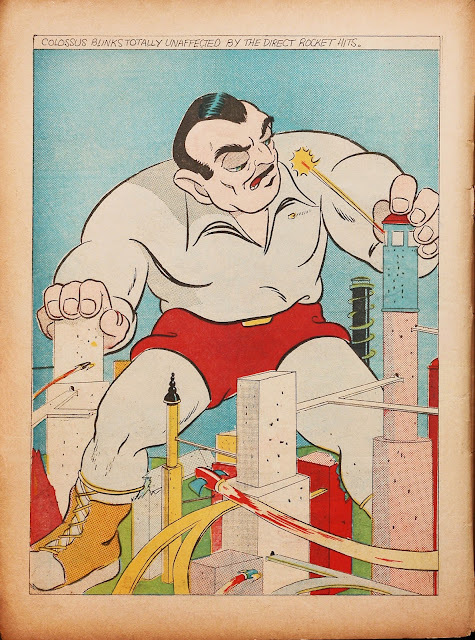 Sun Publications was a pulp publisher started in 1912 by Arthur Gontier, Sr. Sun Publications is known mainly for publishing early work by Louis L'Amour. After being raided for possessing and distributing obscene material (pin-ups used their pulps), Gontier decided to publish historical fiction magazines and comic books. Their first comic endeavor was Sun Fun Komiks which lasted one issue. 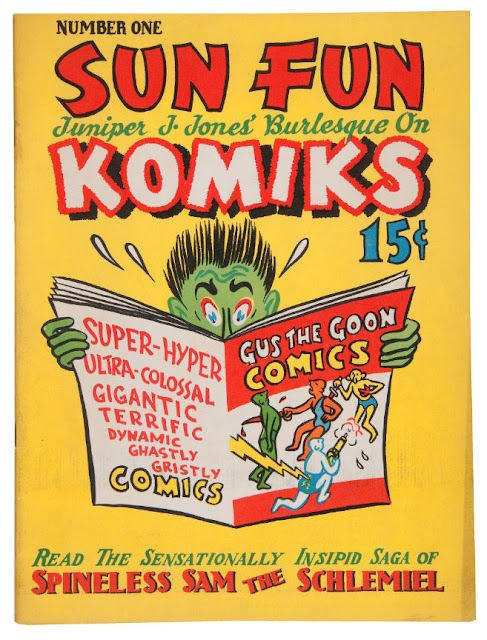 Not much exists of Sun Fun Komiks but there are a couple notable things that happen in the comic. 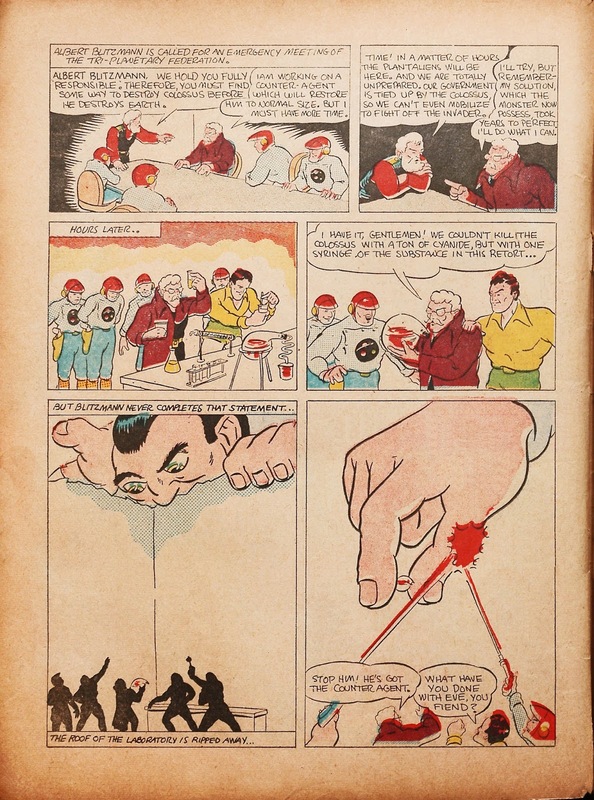 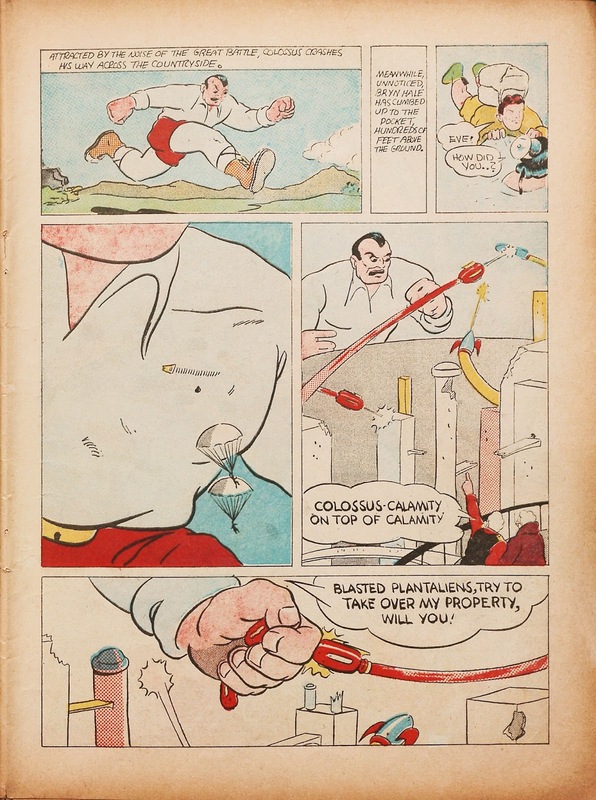 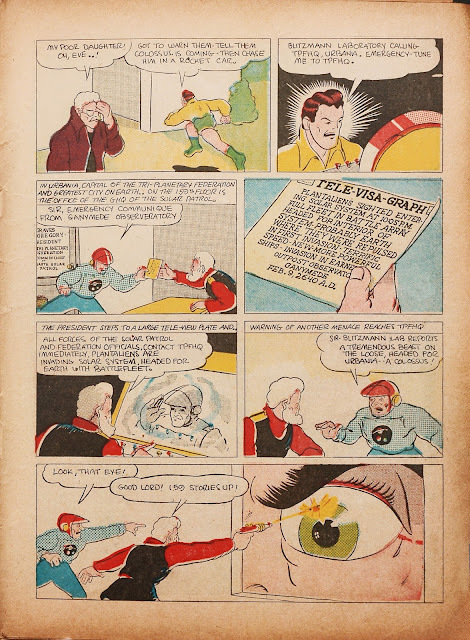 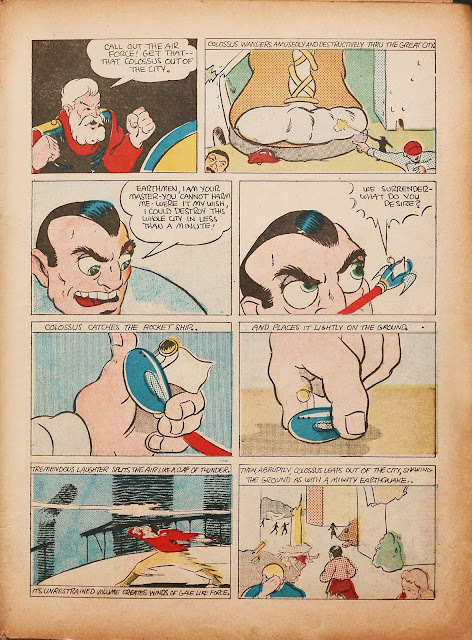 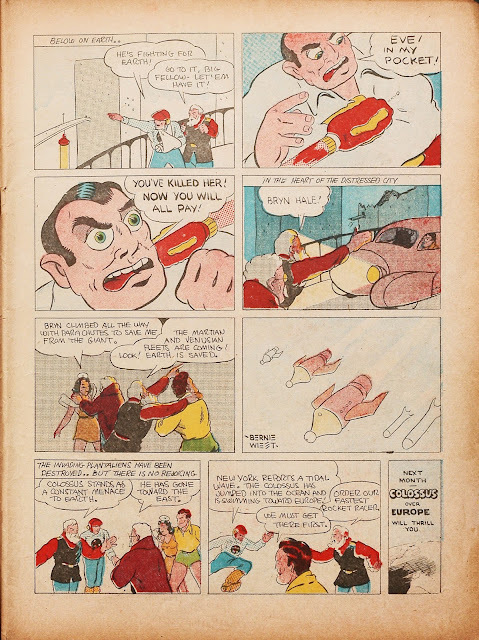 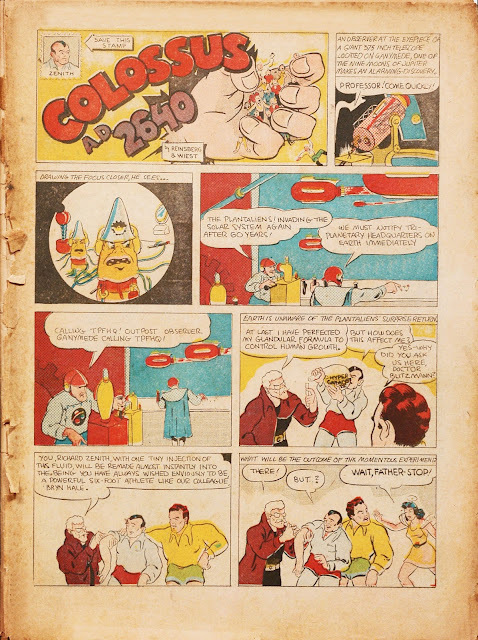 The feature "Supersam" is the first parody of Superman and this comic apparently features the first appearance of Adolf Hitler (seen above). The entire comic is just a parody of comic books which may be why it didn't do very well. The cost of 15 cents may have also deterred potential buyers when all other more popular comics cost 10 cents. 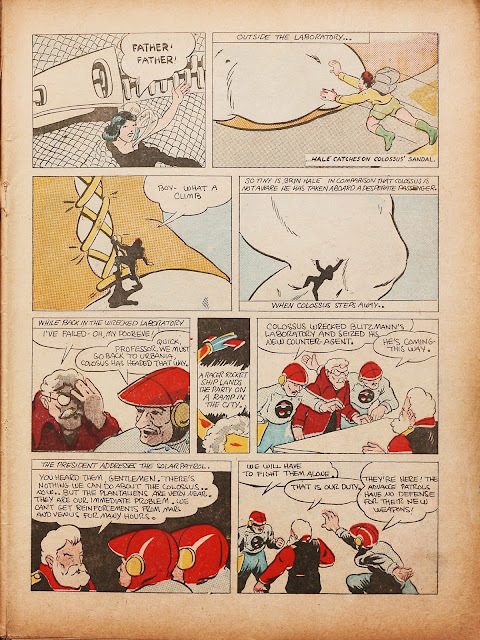 Gontier tried again a few months later, sticking to the formula all the other comic book publishers were doing introducing an anthology series featuring a cacophony of different stories. 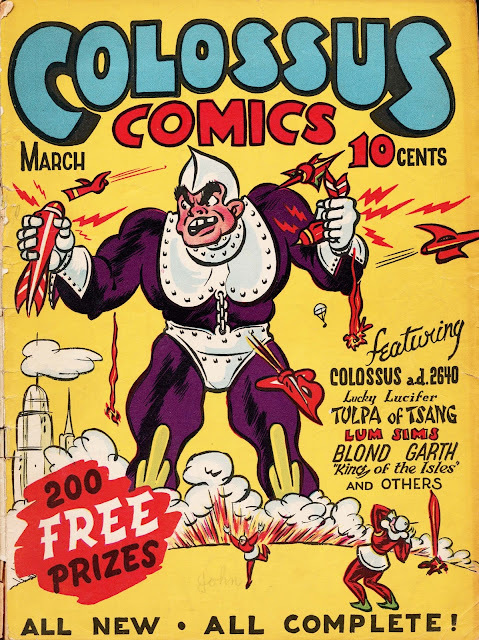 Despite doing what the other publishers were doing including the 10 cent cover price, Colossus Comics only lasted one issue as well but it also spelled the end of Sun Publications. 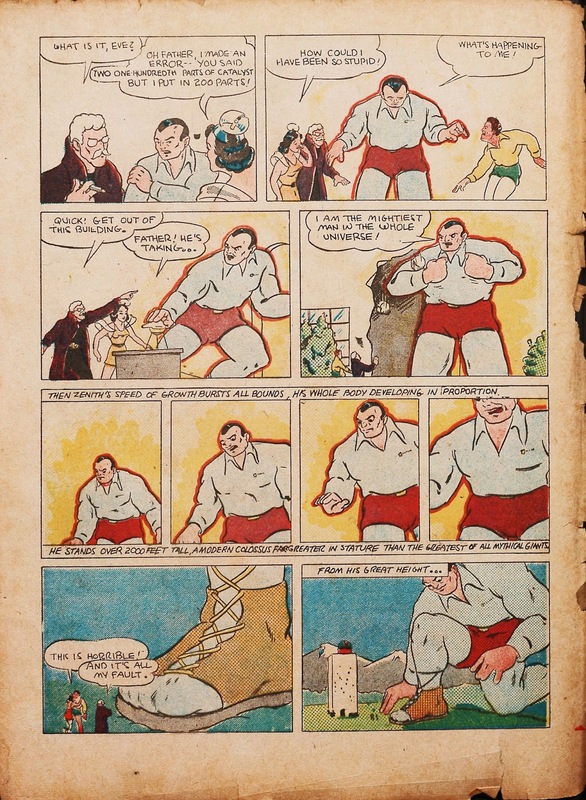 The main feature of Colossus Comics was Colossus, an anti-hero who was a normal man who was given a serum that caused him to grow big and strong. 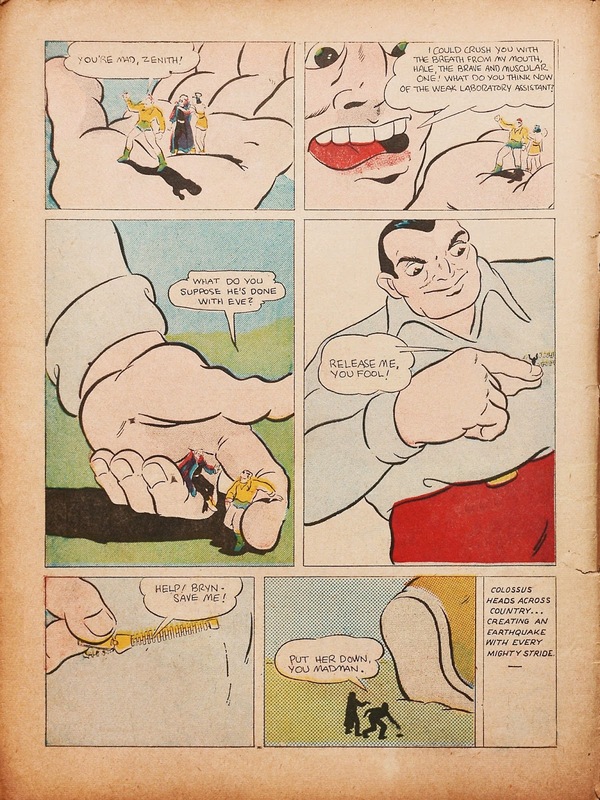 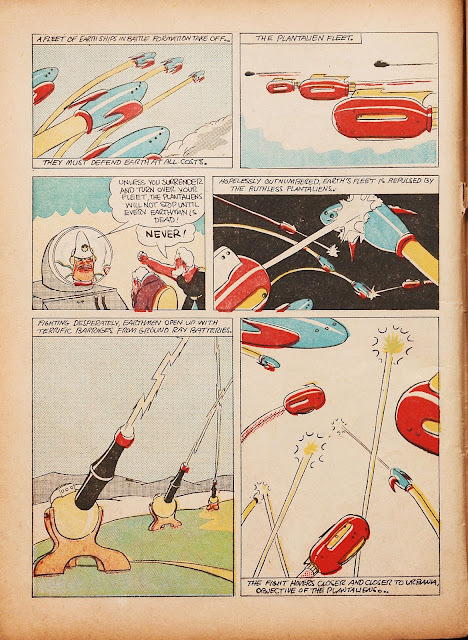 The other stories in the comic were Lucky Lucifer, an aviation series, Tulpa of Tsang, a series that used the mystic of Chinese magic, Lum Sims, a comic similar to the comic strip Li'l Abner, and Blond Garth, a Tarzan-esque comic about a white man becoming a god to native islanders. Blond Garth was drawn by Jay Jackson, a black man who would later work on comic strips for black newspapers in Chicago. 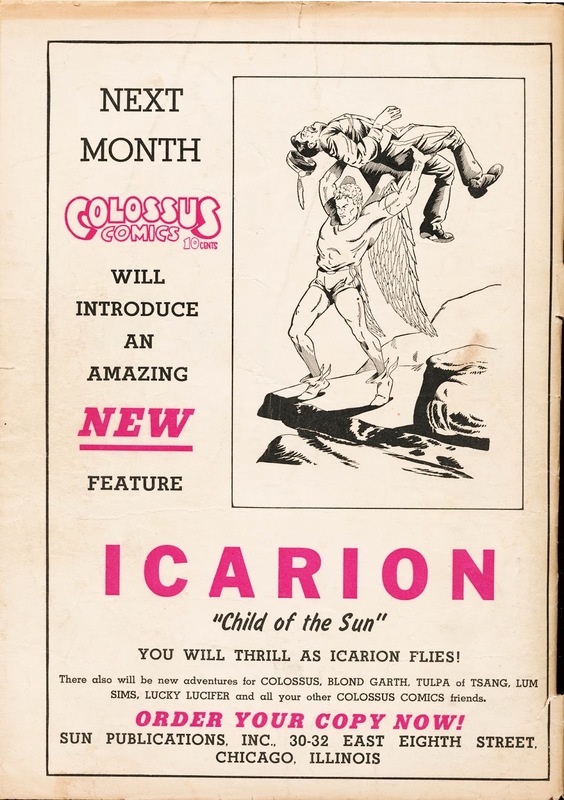 Had there been second issue, Colossus Comics would've introduced Icarion and continued the story of Colossus. 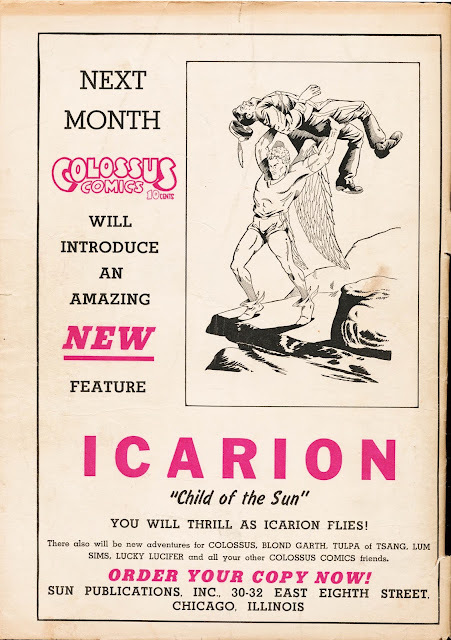 We know little about Icarion but we do have what he would've looked like had the series continued. After-dinner drink? 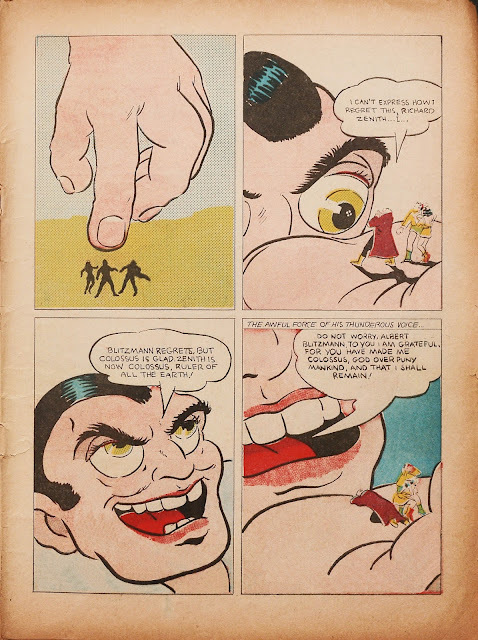 I've never been offered that in a restaurant. 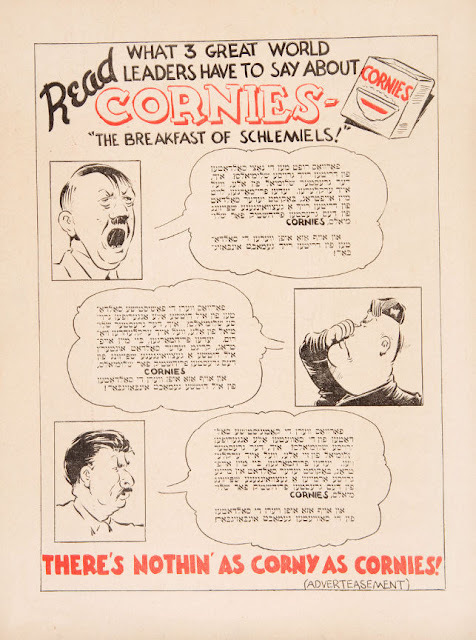 Maybe I'm going to the wrong restaurants. 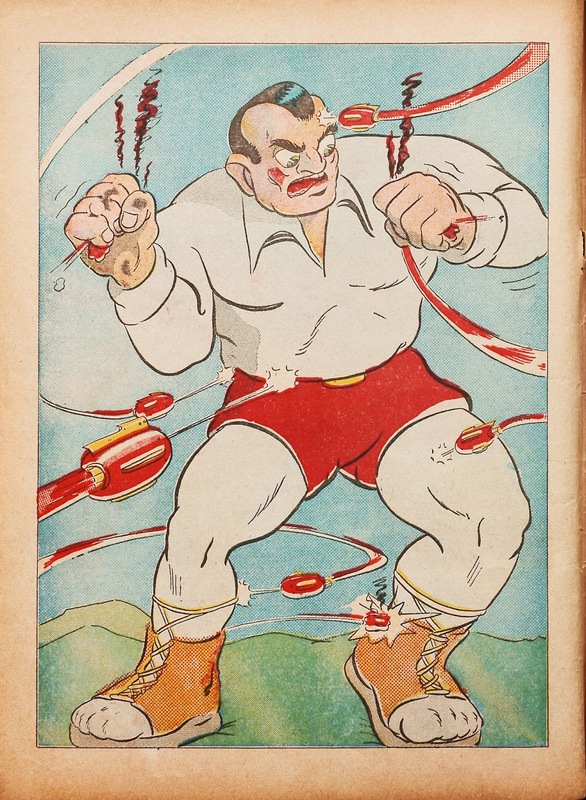 Or, the waiter believes Brutus has a massive drinking problem because he's dining at a fancy restaurant by himself.